Usually, the most up-to-date version of this documentation, and the translations to many languages, are located here: https://kitserver.mapote.com. Documentation for Kitservers 5-8 can also be found there. 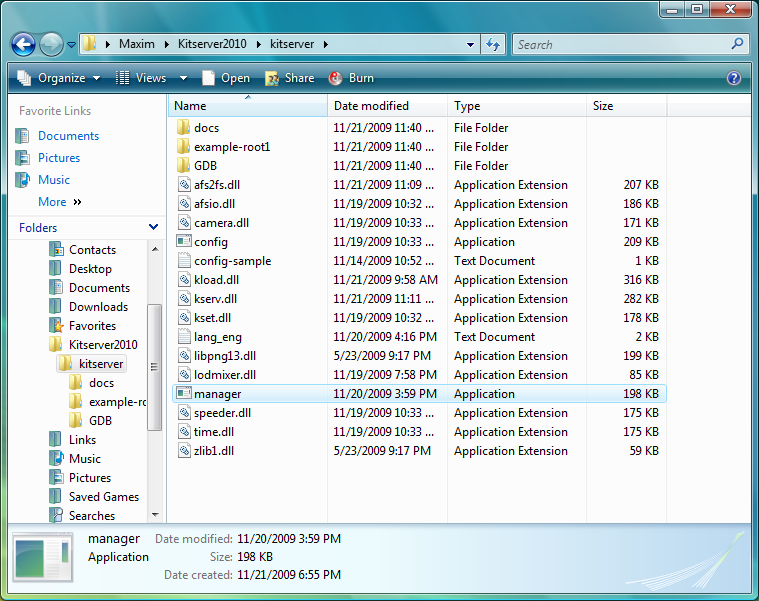 Kitserver 2010 is an add-on program for Pro Evolution Soccer 2010 (and Pro Evolution Soccer 2010 DEMO). It is a loader and manager for various modules, where each module is built as a (typically) independent DLL containing logic to enhance the game in particular aspect. While originally the Kitserver was developed to "serve" kits Pro Evolution Soccer 3, a lot more functionality has been added over the years. Increase the camera viewing angle for Normal and Wide cameras, and enjoy new playing experience. Set match time to any number of minutes between 1 and 255. You can leave the default directory specified in the installer, or you can put in your own. The important thing is that you unpack the files into a place where you have full control over the files (your HOME directory is one example of that.) This will ensure that you won't run into any File Virtualization surprises on Vista, and also that you will NOT need administrative privileges to run the game with Kitserver. Almost there! A couple more steps and we'll have the game running with Kitserver. Now open the kitserver folder and run the manager.exe program. This was previously called setup.exe, but Windows thinks that any application named setup.exe wants administrative access, even though the kitserver's setup actually doesn't. Also, the name "setup" was always slightly misleading, so i decided to rename it to more neutral - manager - because it manages the attachment of kitserver to the game EXE files. If you decide that you don't want to use Kitserver any longer, run manager.exe again and click "Detach", and it will disconnect the kitserver from the game EXE. (This is useful when troubleshooting crashes: you can always temporarily detach Kitserver from the game to verify that the game runs fine without it. And then re-attach the Kitserver later). You can also install/remove Kitserver only for one exe by setting the other one to "no action". We need to make sure there exists a file called config.txt in the kitserver folder. If you're upgrading your Kitserver, then you might already have it in there, in which case the installation/upgrade is done. If not, then it's easy enough to create the config.txt file: just run the Kitserver's configuration tool, click "Save", and it will make the config.txt for you. That's it. You're ready to launch the game. 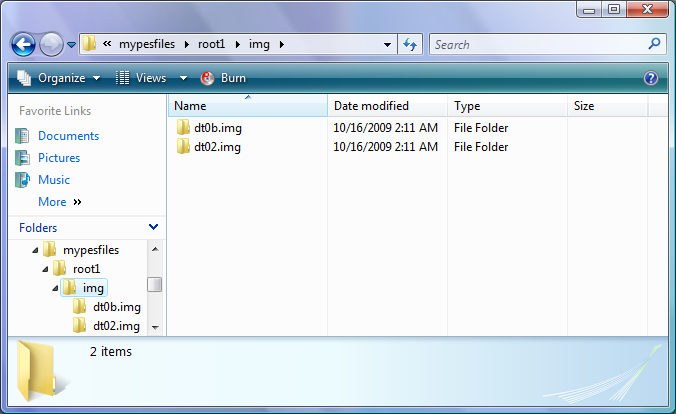 REMEMBER: you need to start the game using the game EXE (pes2010.exe) in Kitserver2010 folder, because that is the one that has the kitserver attached to it. For folks who had been using kitserver for some time, it is worth noting that it is still possible to install the kitserver the "old" way: in the game folder. Everything would still work fine, as long as you do everything as Administrator: run config.exe, run manager.exe, and you have to run the game as administrator too. I would honestly not recommend doing that, but instead adopt the new way. It is safer and you don't need to worry about administrative privileges, and you don't run into File Virtualization issues which can lead to nasty surprises, and many hours spent muttering things like: "why does my config.txt show correct setting, but in the game i don't see the effect? What is going on?!!..." Uninstall is very easy: just delete the Kitserver2010 folder, and that's it. 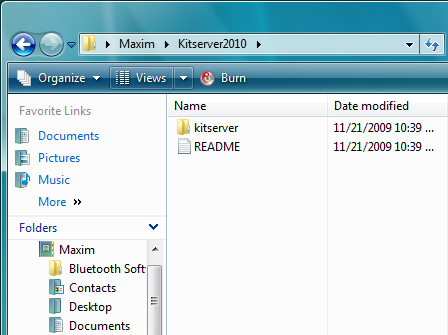 Kitserver doesn't write into system folders, or anything of that sort, so removal is very simple. Also, it is worth reminding that you can always temporarily detach the kitserver from the game exe, and then re-attach it back, by using the manager program (as described in 2.1 section above). This is useful when suddenly you get game crashes, and you are not sure whether Kitserver is at fault, or there is some other reason. From time to time, Konami releases patches to the game. There is already 1.01 and 1.02 patches, and there probably will be more released in the future. When you install these patches, you get a brand new game executable (pes2010.exe) among other things. It is important to realise that Konami patch doesn't now about your Kitserver installation, and therefore the game EXE in your Kitserver2010 folder will still be the old one. So what you need to do is copy the new game EXE over to the Kitserver2010 folder, then run the manager.exe program and attach the kitserver to the new EXE. Assuming, of course, that Kitserver supports the new EXE, that's all there is to it. 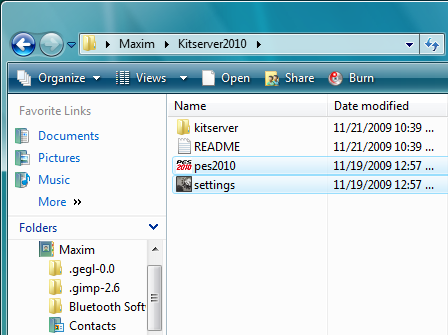 Now you can again start the game from Kitserver2010 folder. Kitserver uses a file called config.txt as its main configuration file. A lot of things are specified there, including which modules to load, what settings those modules should use, and etc. Go to your kitserver folder and you should see a file called config-sample.txt. (I gave it a different name on purpose: so that those who upgrade their kitserver installation don't accidently overwrite their existing config.txt). If you aren't upgrading then the chances are that you don't have an existing config.txt, in which case just rename (or copy) the sample config into config.txt (or run configuration tool, click "Save" and it will do the same thing). Otherwise you may want to compare the sample config with yours and see if you need to make changes to your config: such as add new modules in the [kload] section, for example. The order of the DLLs is important. In particular: zlib1.dll, libpng13.dll, afsio.dll must be loaded in that order before kserv.dll; afs2fs.dll after kserv.dll. Only in very rare situations you should try re-arranging the DLLs. Formerly known as lodcfg.exe (it used to be the GUI tool for LOD mixer only, but now it covers other configuration options as well), this simple GUI program allows to modify some configuration settings in config.txt. It's a helper tool and all that it does, you can also do manually, by editing config.txt in your favourite text editor. In fact, some things you can only do manually - like adding and removing modules (DLLs). But for simple things - like changing resolution, or choosing camera angle - it's faster and easier to just launch config.exe, quickly adjust things, then click [Save] button, and you're done. You can see from map.txt above that in order to find a kit for team #23, the kitserver needs to go to the folder GDB\uni\National\Russia. This folder will contain all of the kits that are available to team #23. Inside it, you must create an individual folder for each kit. Like this: For players, 1st kit must have a folder name pa, 2nd - pb. Extra kits can have any folder names that start with letter "p". I found it useful to prefix all extra kits with px-. For example, px-redwhite. For the goalkeepers, 1st kit must be in the folder ga, 2nd - in the gb. Extra kits can have any folder names that start with letter "g". Please note that it is currently NOT possible to select goalkeeper kits, but this feature will be implemented in the future versions of kserv.dll. Extra kits will also be supported for goalkeepers. LOD-Mixer is the module that allows to fine-tune some aspects of PES2010 graphics engine. Currently the following features are implemented: screen resolution and aspect ratio correction. All of these can be configured manually in kitserver's main configuration file (kitserver/config.txt), but you can also use Kitserver's configuration tool (config.exe). This feature may be useful to people who like to play a tournament - a league or cup together. 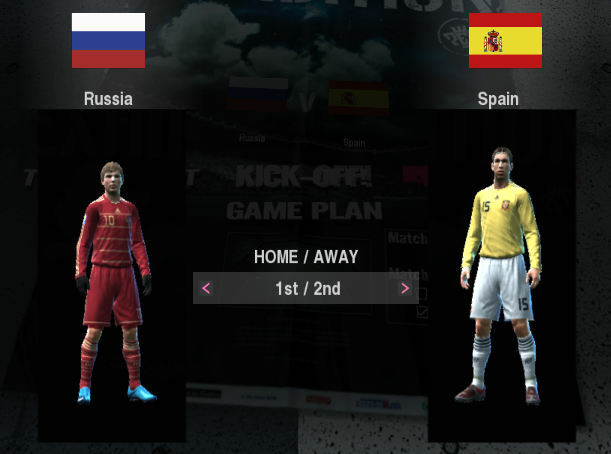 PES 2010 doesn't allow human players to control both teams, unless both of their selected teams are playing against each other in the match. With this new feature, you can remove that limitation. Now, even if it is for example, P1 vs. COM game, or P2 vs. COM - you can freely select which team you control with each controller. So, you can both play on the same team, or you can let your friend control the opposition - to make things more interesting. You can also now choose a "Spectator" mode for in tournaments. Another possiblity opened by this feature: in training mode, you can play for defence and/or goalkeeper. Very handy to train penalty saves! Unfortunately, PES series had always suffered from an overly- conservative LOD configuration, where the switch to low-poly models would happen way too soon, and that would result in various visible artifacts. In PES4-PES6, examples were: balding players, and missing details on kits. In PES2008-PES2010, the players and referees appear to have blurred generic faces, once they move slightly away from the camera. Also, if on the contrary, your machine is stuggling to run the game at a smooth frame rate, you can try moving the LOD sliders in the opposite direction - thus making the engine switch to the low-poly models sooner than normal. This may improve the framerate, although at the expense of picture quality. To achieve that, move the sliders to the left. The lodmixer module also supports 6 more LOD settings, which aren't shown as sliders in configuration tool. Those are LOD settings for so called "active player". This is the player that is controlled by human player during free kicks and corner kicks. "Active player" LODs are also used by the game during uniform selection screen and in Edit Mode. Basically, i got lazy, and didn't feel like adding 6 more sliders to the configuration tool :) And also couldn't quite figure out where exactly to put them, without totally clobbering the UI. But you can still use them, by adding them manually to [lodmixer] section in config.txt. You probably not going to use all of them, but you might find this one handy: lod.active.player.fk.s1. 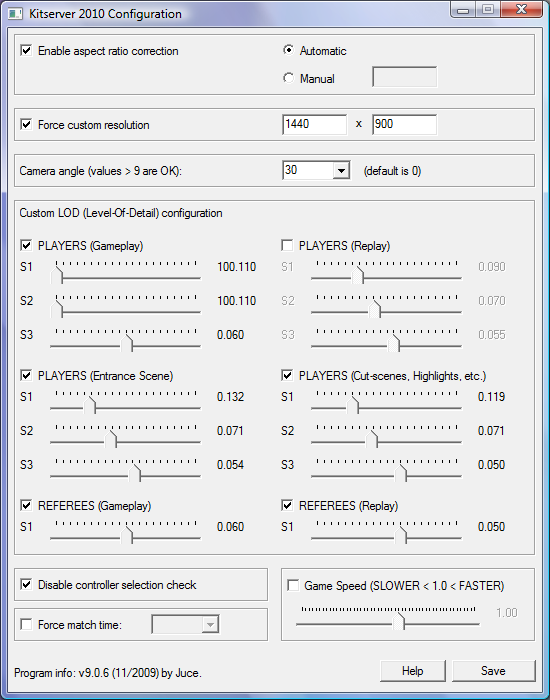 I put this setting into the config-sample.txt, and set the value of it to 0.010 - this gives maximum detail for the player taking a free kick. Configuring LOD well takes time and is best done via trial-and-error method. (If it was easy, it would've been probably done right in the first place!) I'd like to mention a few considertations here that should help you with LOD configs. That is not true either. Current generation of games has become quite sofisticiated and resource-hungry. GPU and CPU are working hard to process the rendering, physics, AI logic. 60 FPS is the typical minimum frame-rate at which a game needs to run, in order to provide nice and smooth gameplay. That means the rendering of the entire scene must fit into 1/60th of a second and still leave some time for other tasks to be done. (Physics, in particular is often run at the same rate as rendering, so that the picture doesn't suffer from noise.) To make sure rendering time doesn't escalate dramatically as more objects are rendered, LOD is often employed as the optimization technique. By moving all sliders to the right, you are effectively disabling the LOD algorithm and telling your GPU: "render all objects on the screen at the most possible detail. And if you fry while doing that, i don't care!". Ok, so maybe it's not a funny example, but you get the point. Problem: during free kick, the player that is taking it is not rendered with full detail, even though i have all LOD sliders set to maximum quality. 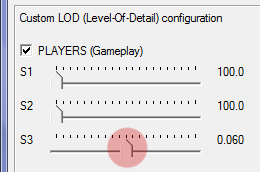 Solution: use the "active player" LOD setting (not shown in config.exe), called lod.active.player.fk.s1 - set it to 0.010 in [lodmixer] section of config.txt file. For reasons known only to Konami product managers, for the third(!) year running, they took away the interface feature that allowed to adjust camera angle (it was in PES3-PES6, but it disappeared starting with PES2008). The underlying logic is still present in the game executable though, and this module allows you to take advantage of it. You can adjust the camera angle: standard values are 0 - 9, but you can actually set a bigger value, which will result in camera turning even more. For example, i like to play with angle value set to 30. This tiny module allows to stretch the length of the match to normal 90 minutes, if you want, but really you can choose any number of minutes between 1 and 255. Going beyond 90 will make the seconds flow slower than normal. Also, another extreme is setting the match time to 1 minute. This is a whole new experience too: you have to really treasure the ball - keep posession, or you risk not getting it back at all, before the final whistle! Also, if you get a scoring chance, better put it away, because chances are it'll be the only one you get. It is possible to decrease the game speed and also to increase it. The configuration tool has the 'Game Speed' slider for easy adjustments. 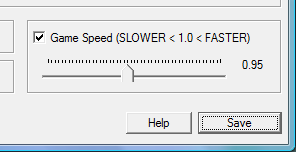 The value 1.0 gives the default unchanged speed. Less than 1.0 - slower gameplay, greater than 1.0 - faster gameplay. It is not advised to use values lower than 0.7, because the music/commentary starts to break up. Also values larger than 2.5 are not supported. It is already ridiculously fast with 2.5!. Big thanks to: England and Energia - for help with 1.1 and 1.2 EXE support, PATe.Arminia - for help with kit attributes, Stelios and ninuzzu - for KitsRelink tool, which helped me greatly when i was working on kserv module, Ariel - for great-looking kitserver logo. Beta-testing: members and guests of Evo-Web and PesWe.com forums. Special thanks go to: administrators of PesWe.com website and members of PesWe forums.